A fun antique style silver weighty ring which is guaranteed to add some interests to your finger! 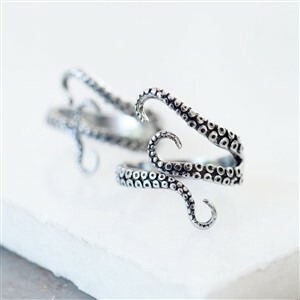 Our octopus ring is fairly chunky and will fit any finger size as the ring can be squeezed smaller by pressing quite firmly with your hands. We have a huge collection of different animal rings from Flamingos, hares, squids to rhinos and rabbits.